New Jersey’s largest divorce and family law firm participates in NO MORE Week, March 6th – 12th, with giveaway of legal resources to aid victims of domestic abuse and assault. NOMORE.org's Week of Action is designed to keep the conversation around domestic abuse and sexual assault going, and have new voices join in. We are pleased to do our part by making available our in-demand legal resources for domestic violence victims. Weinberger Law Group of New Jersey joins with NOMORE.org to recognize NO MORE Week of Action, a national effort to increase domestic violence and sexual assault awareness and prevention at the grassroots level. Taking place March 6-12, the annual advocacy week focuses on real-life steps individuals and organizations can take to make the conversation around domestic abuse and assault prevention something that takes place year round. Weinberger Law Group is supporting NO MORE Week of Action by providing free legal resources to victims and victim support agencies, including the Kindle e-book, A Guide For Domestic Violence Victims in New Jersey and the informational downloads, Spousal Spying: Are You At Risk? and Keeping Computers and Smartphones Safe from Spying Spouses, among other resources. “Most people recognize NOMORE.org as the organization behind the compelling domestic violence awareness commercials that run during the Super Bowl. NO MORE’s Week of Action is designed to keep the conversation around domestic abuse and sexual assault going, and have new voices join in. We are pleased to do our part by making available our in-demand legal resources for domestic violence victims. This is legal information that can help victims and their children stay safe,” says family law expert, frequent media commentator on domestic violence, and Weinberger Law Group founder, attorney Bari Z. Weinberger, Esq. 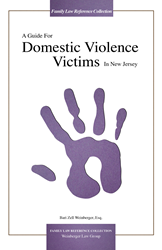 Available March 6-12 for free on the Amazon Kindle store, A Guide For Domestic Violence Victims In New Jersey, outlines the legal rights of domestic violence victims in New Jersey and offers practical steps for obtaining a restraining order, filing for temporary spousal and child support, and other legal remedies. “Victims can immediately put this information into action,” notes Weinberger, who authored the book. Also available during the Week of Action are the family law firm’s two downloads related to spousal spying, Spousal Cyber Spying: Are You At Risk? and Keeping Computers and Smartphones Safe from Spying Spouses. “Here is today’s very harsh reality: smartphones and computers are used to stalk and control victims of domestic abuse. Incredibly, 85 percent of domestic violence shelters in the U.S. have victims asking for help with GPS tracking apps placed on their phone by their abuser. There is an immediate need for much more awareness around this issue. We need to stop this,” notes Weinberger. Weinberger Law Group will also make its slideshare presentation, Domestic Violence 101: A Guide For Spousal Abuse Victims In New Jersey, available during the week. NO More events scheduled to take place during Action Week include an advocacy postcard display in New York City, social media chats, and a special Law & Order SVU television marathon (SVU star Mariska Hargitay is a co-founder of NOMORE.org). The week also includes fundraising opportunities for NO MORE’s Project Hopeline partnership with Verizon. Weinberger Law Group participated in Project Hopeline this past fall when it collected cell phones to benefit domestic violence victims and their families. Local No More Action Week activities are listed on the organization’s website. Weinberger Law Group is a family law firm serving divorce and family law clients throughout New Jersey with offices in Bergen, Burlington, Monmouth, Morris, and Somerset Counties. The firm offers free initial attorney consultations for legal help with family law issues, including divorce, child custody, post-divorce modifications, domestic violence, prenuptial agreements, adoption, LGBT-related family law issues, and all other family law matters. For more information about Weinberger Law Group, please visit WeinbergerLawGroup.com or call (888) 888-0919.